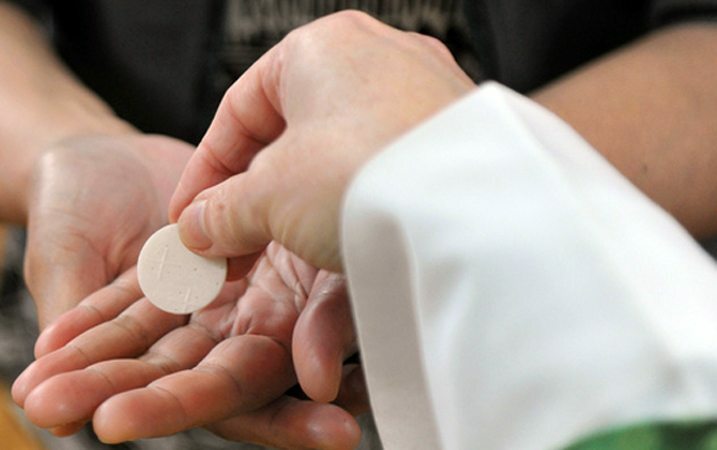 First: Holy Communion delivers forgiveness, life, and salvation. Through Holy Communion the Holy Spirit strengthens faith because by eating and drinking the true body and blood of our Savior in faith we receive His promise of forgiveness based on what he did for us by his body and blood. Because we recognize how dangerous sin is in our lives, we offer this unique and precious means of grace. Second: Holy Communion unites us in Christ. St. Paul said, “Because there is one loaf, we, who are many, are one body, for we all partake of the one loaf.” Many people feel alone in this world. Holy Communion brings us together as the Body of Christ in a way that transcends time and space. Think of it: “Therefore with angels and archangels and with all the company of heaven we laud and magnify Your glorious name, evermore praising You….” With those words, which are spoken before receiving Holy Communion, we affirm that Holy Communion is a very special means of uniting us with Christ, with one another, and with believers throughout the world and throughout the ages. It’s a foretaste of heaven here on earth. Being united to each other as the Body of Christ through the body and blood of Christ is a vital means for unifying us in our mission and ministry. We don’t have to offer – or receive – Holy Communion every Sunday and Feast Day service. We could offer it once or twice a year as was the practice in many churches. However, following the practice of the early Church and the Lutheran Church for centuries after the Reformation, we offer at every main and Feast Day divine service the meal in which Jesus gives his living and life-giving body and blood. It is pure gospel. Other questions come to mind about offering Holy Communion at every Sunday service. Won’t we take Communion for granted if it’s offered more often? It is true that we sinful human beings tend to take good things for granted. When it comes to Holy Communion the answer is not to withhold the Sacrament as if “absence makes the heart grow fonder” is a proof passage from the Bible (it isn’t). The solution is to regularly emphasize what Holy Communion is and offers. Take a look at “Christian Questions and Their Answers” from the Small Catechism on p. 329 ff. in our hymnal Lutheran Service Book. Note question 20 and its answer. It reflects what Martin Luther once said, “If you knew how many fiery darts the devil was shooting at you, you’d run to the Sacrament of the Altar every chance you got!” An early church father once described Holy Communion as the “medicine of immortality.” Through Holy Communion the Great Physician preserves us in body and soul until we inherit eternal life! Isn’t this going to make the service longer? Our aim is to keep the service to around one hour. Considering the purpose of each part of the service, which could be categorized as “Gather” “Word” “Meal” and “Send,” we strive to celebrate the sacrament in a way that is in balance with the other parts of the service. So that the distribution of the elements does not become a distraction because of the length of time it may take, we may use “continuous Communion” distribution when there are many worshipers. Considering that most movies run nearly 2 hours, God’s Elect don’t mind if the service runs between 60-70 minutes. Use the waiting time during distribution to pray. We are in the presence of the living God! Does this mean churches that don’t offer Communion every Sunday are wrong? No. Not at all. Because God does not command an exact number of times to offer Holy Communion, there is no right or wrong about how often Communion is offered. Isn’t it more work to set up and clean up? The divine service is the source of our life in Christ. What an important way to serve our Lord and each other by preparing the gifts of God for the people of God! By offering Holy Communion often, we are giving another opportunity for our members to serve. Consider helping with the altar guild, the group in charge of Communion set up and take down. Volunteer with your young children, so that they can learn more about the meaningfulness of Holy Communion. What about visitors? In general the unchurched are respectful of the practice of Closed Communion. Just as new guests at your home wouldn’t think to open your refrigerator and help themselves to some food without asking, so unchurched visitors usually ask to learn about Holy Communion before receiving it. If you invite guests to worship and are concerned about leaving them in the pew while you receive Holy Communion, you might choose to remain in the pew with them instead of receiving Holy Communion. No one is forced to take Holy Communion just because it is offered. If a member would like Holy Communion privately later, the pastor is happy to offer it at a convenient time. What is “Closed Communion”? We are a sacramental church. We believe that through Holy Communion God comes to us with forgiveness using tangible means. Because the gospel has convinced us that Jesus’ body and blood are present in his Supper and that receiving the Sacrament together unifies us in our beliefs and commitment, we ask our guests to speak with the pastor before communing. We want to make sure those who commune with us understand what is being offered and what is being confessed in Holy Communion. We don’t want to be presumptuous and put guests in the position of stating their agreement with our convictions before we have had an opportunity to explain them. So Communion is “closed” to those who do not know or are in public disagreement with our confession of faith until there is a mutual understanding and agreement with what Communion is and what our church confesses.